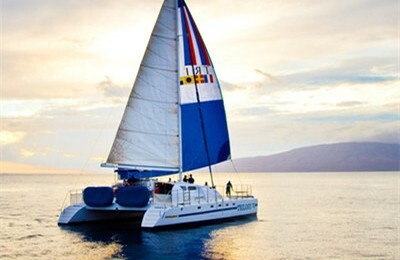 The beauty is breathtakig while snorkeling in Molokini crater, let’s do it in a most comfortable way . Molokini Crater is a partially submerged volcanic crater that features some of the clearest water for snorkeling anywhere in the world, with a typical 150 feet or more visibility, colorful coral reef and a wide varieties of marine lives,a snorkel trip to Molokini Crater is truly a rare yet memorable experience. Alii Nui is a 65′ custom built catamaran, the most beautiful catamaran in the Island, comes with ample deck space and huge saloon area, offers fresh water showers and over sized restroom. Comes with top of the line snorkel equipment. Also included as regular amenities are boogie boards, water noodles, wet suit tops, optical masks and large terry beach towels. Once you have had your fill of snorkeling, enjoy a refreshing “rinse-off” shower with our heated fresh-water shower. 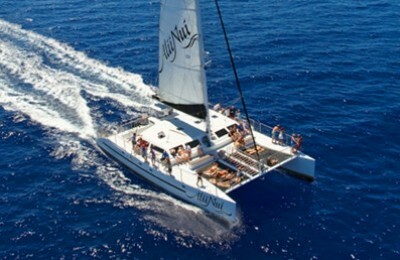 A 65 footer custom built Catamaran sailboat, in great condition.